Whether your website is brand new or 5 years old, if you’ve never looked into how to get more traffic, chances are people won’t find your website. 99% of blog posts are never seen. Business websites without blogs often fare even worse. But there are other ways to get found by your target customers. These 7 clever techniques will increase website traffic fast. Let’s start with the super fast way to increase website traffic fast. That’s PPC. PPC or pay per click is when you pay a search engine like Google to show your ad in the search results in a special and very visible section for ads. Over 50% of website traffic comes in through a search engine. So this is a great place to be when you need to increase website traffic fast. Nearly half of all query results will include ads. If you’re not advertising here, your competitors are. Google’s Ad platform, formerly known as Google AdWords, is the most common and advanced PPC platform. Let’s take a closer look at the most clever and effective ways to use it to generate more visits to your website. This applies to all of the methods we’ll talk about to increase website traffic fast. Research your costs and write them down. Know that costs involve more than just the ads. Research and Planning — This takes more time than you might realize. Failing to budget can lead to a “spend as much as it takes. It will be worth it in the long-run.” mentality. When people think like this, they don’t realize how inefficient their campaigns are running. Or people end up spending the whole budget on ads. They don’t realize there are other expenses. The result is spending too much to increase website traffic fast. It’s simply not necessary. With a TV ad, you pay up front. The cost is based on viewership. But with PPC, you only pay when someone clicks your ad to go to your site. That makes PPC much more cost-effective for small businesses. Pay for what you actually use. That’s a good system. You can set a daily max for your campaign. This is the most you are willing to spend in one day. You can set this as low as $10/day. But to increase website traffic fast you generally need to set it a bit higher. That way more people are seeing your ad again and again. The repetition helps increase clicks. You’ll also set a max bid for each keyword on which you want your ad to appear. A keyword is a phrase that someone enters into the Google search box like “Best Chicken Wings in Atlanta”. If you’re a restaurant that sells them, this is a great search for you to appear in. Cost per click in on the rise. 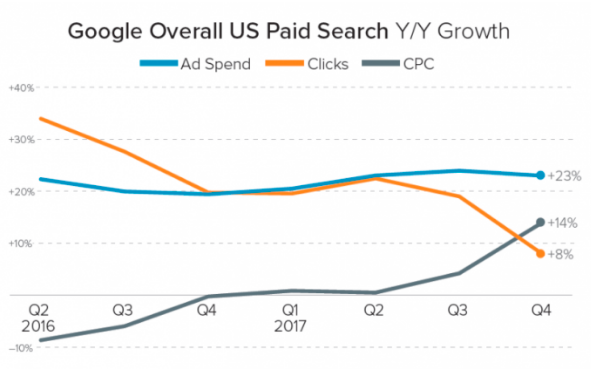 But you can also note from this chart that ad spend is staying steady as people get smarter about how they use PPC. One of the worst things you can do in PPC is overpay for ads. You’ll wipe your ad budget out fast with little to show for it. People who are new to PPC often don’t apply basic best practices. They think of it like a magazine ad. You just show the ad. People like it or they don’t. The ones who do, buy. The others, you don’t really worry about. But in PPC, quality matters above all. Google wants people to only see ads that are very relevant. When they do, more people click. Quality matters so much that Google gives you a grade. If you get a good grade, they reward you with lower priced ads. If you get a bad grade, they can increase how much you pay by as much as 400%. At that price, Google Ads are cost prohibitive. Greet the clicker with a great website user-experience and a landing page optimized for conversions. Yes, Google looks at that too. Use negative keywords to keep your ad from appearing in searches that don’t make sense. These are keywords that you don’t want associated with your brand. Now let’s move on to keyword research, the centerpiece of an effective PPC strategy. A keyword is a phrase a person might enter into a search. It will often have 3-6 words in it. Use Google’s Keyword Planner to learn more about what people enter in searches. When you enter a word, it will offer suggestions to add or replace the word you entered. For the example below, I entered the keywords “wedding packages” and “wedding planner”. Google ads came back with over 1,200 more keywords related to these. Now, as a small business owner, you would just have to sift through those words and see which ones apply most to your target audience and fit your budget. This can be very time consuming, so consider hiring an experienced advertising agency to do it for you. Have decent traffic. But know that the more specific the word is the less traffic it will have. That’s okay as long as it’s getting something. Are lower competition. It will be easier and usually cheaper to show your ad. But going too cheap hurts your Quality Score. Lower competition can mean less relevant. Find a balance. You can build an ad campaign around. It’s okay to select words that are expensive. You can set a max bid for that word. Then when you get that Quality Score up, your ad will display without that high cost. But realize that some words are worth paying more for. If the word suggests that someone is ready to buy now, it might be worth paying a premium. Always enter negative keywords as well. A person looking for “Where to Get a Great Steak” probably isn’t the same person looking for “Great Steak Recipes”. But you could appear in this search is you chose “broad match” instead of “exact match”. Negative keywords prevent this. You may want to add “recipes” as a negative keyword. Once your campaign is running, you’ll see what searches you appear in. Check this regularly to add more negative keywords. Social media ads are similar to PPC. The main difference is that you’re using the data that the social media platform has collected to send ads to the right people. The exception is Pinterest, which is keyword based like Google Ads. There are around 3 billion active social media users around the world. That’s 42% market penetration rate. 50% of people check Facebook daily. That’s more people than watch TV now. If a person has Internet, they have 1 or more social media accounts. Your target customers are here. But are they buying? 41% of people say they use the Internet to stay in touch. 40% want to stay informed. 39% use it because they’re bored and looking to be entertained. The number 8 reason people use social media is to learn about new products and services they may want to buy. 50% of people say that social media is the best place to show them an ad. 57% say social media ads are more relevant to them. And that’s why they like it. But advertising on social media isn’t like running a radio commercial. Here’s what you need to know to use social media ads to increase website traffic fast. Your goal in social media is not to get in front of the most people. It’s to get in front of the right people. These are the people who are most likely to visit your website and buy what you’re selling. Target major traits like male/female, income levels, education, etc. Then dig down to who the likely customers are. For example, consider targeting life events. If it’s close to someone’s anniversary, show an ad for anniversary gifts. If someone is a new parent, they may want to treat themselves to a spa day or a buy new baby clothes from your ecommerce store. To increase website traffic fast through Facebook or other social media platforms, be very selective about who sees the ad. Select the associated traits when you’re setting up an ad. Then build an ad that is very relevant to that group. That’s how to get the best click-through-rate and the best conversion rate once they reach your website. If you’re a local business, don’t forget to target your local area only. Don’t pay for clicks from people across the country who will never become customers. Facebook will also allow you to target people visiting a certain area or who’ve just moved into an area. If your business appeals to tourists or people new to town, take advantage of these options. Even if you’re not a local business, you may find geo-targeting effective. Create an ad that’s highly relevant to a local group of people to gain a foothold in an area. Use the dynamic remarketing function in Facebook ads to bring people back to your website who’ve already visited. If someone left without completing the transaction, this is your big second chance. It’s valuable. Companies who use remarketing can double their revenues. An Adobe study found that the click-through-rate on remarketing ads is 400X that of marketing to someone who doesn’t know you. The Internet can be a very distracting place. Cut through distractions and gently guide people back to your site. In Facebook’s Ads Manager, you can choose to have the ad appear on Facebook, Facebook Messenger, Instagram and/or Facebook’s partner sites. This allows you to be where your target audience is. Only target audiences who are likely to be customers. Targeting 1,000 likely customers is better than showing the ad to 1 million random people. Make the ad very relevant to the traits chosen to target. The most relevant ads appear to be speaking directly to a person. Track your progress. If your response rate isn’t what you expected, dive in and figure out how to improve it. Align the landing page on your site with the ad. You want to increase website traffic fast. But sending them to a home page, service page or category page is rarely effective. Greet them with a landing page that requires them to take one action like click a button. The simpler your landing page is, the more relevant your ad will appear. of day. For example, if you’re a restaurant serving dinner, the best time to run ads is 1:00pm – 5:00pm when people are still at work and thinking about dinner. For seasonal or time of day oriented businesses, showing the ad at the right time is as important as the ad itself. This ad for a local diner in Oregon is best shown late at night or early morning to put the idea of their diner for breakfast in the viewer’s head. Do you already have a post that did very well with your social media fans? Get the most out of it by boosting that post. Think of your social media fans as your testing area in addition to potential customers. If they like something, then that means your target audience does as well. Platforms like Twitter, Facebook and Instagram will allow you to send the post to a wider audience of people similar to your own. You can create a lookalike audience that looks like your followers. You can upload your own list of contacts to re-engage your existing customers. Or select traits and locations to target similar to a regular ad. But not every ad that does well is worth boosting. Remember, your goal is to increase website traffic fast. Let’s look at what makes a great boostable post. The post was popular among your fans. If you don’t currently have many fans, you can also use boosted posts to get more fans. The post directs them to your website. Sometimes you share the content of others on social media to engage in between original content. But don’t pay for free advertising to other people by boosting a post that links to someone else’s site. The post has a video or image attached. Posts with a visual have a 650% higher engagement rate. It appeals to a larger audience. If the post was about an employee of the month or a contest that’s already over, it may not appeal to a larger audience. It appealed to your fans because they had unique interest in the post. If you already have a following on social media, this is one of the cheapest ways to increase website traffic fast. Time is still involved, of course. Share content on your website with a great headline and image/gif. If you don’t have a following, it’s time to start building a social media following. Reap the rewards of an instant audience when you have something to share. Here are some important best practices to apply to increase website traffic fast with social media posts. Don’t be salesy. Rarely, if ever, link to your product or services pages directly. Instead get people invested in great content on your site. Or lead them to a landing page with a special offer just for your fans. Keep direct promotion to a minimum. This is the social way to promote your website. Write Compelling Headlines. Don’t just share and expect people to click. Research what makes a great headline and use analytics to find out which headlines perform best. Use Images and Videos. People on Twitter are 18% more likely to click a link if there’s an image. Remember, people have endless feeds of content. You have less than 2 seconds to get attention. A visual is the only way to get attention long enough for them to check out what you have to say. Time your posts and be consistent. Do you save all of your social media tasks for Saturday? You’ll have lackluster results. The only way to engage and keep people engaged is through regular sharing. Use social media automation. If you have trouble managing social media every day, use automation. This isn’t the best solution. Daily monitoring of social media is advisable. But it’s a good start. Ensure you have full monitoring when you work with a social media management company. We’re discussing how to increase website traffic fast. The method that will work best for you depends on what tools you have at your disposal. Some methods are much more cost-effective in the long-run. They’re better in the long term as part of a comprehensive strategy to drive traffic. Email subscribers are 3X as likely to share your content with others. 88% of retail marketers say emails are the best way to retain customers and keep them buying more. The ROI on email is 44:1, which beats out any other channel by far. In permission-based email marketing, build an email list of people interested in your brand. Then send content to them regularly to nurture that relationship. 77% of consumers (and 86% of B2B buyers) say permission-based email is the preferred way for you to communicate with them. Let’s take a look at the best way to use email to drive website traffic. Next, you’ll begin segmenting the list to deliver the most relevant content. If your customers are plumbers, carpenters and roofers, you might segment by profession. If you have people around the country signed up, it makes sense to segment regionally. You can segment by age, employer, interests and many other traits. You can also segment by behavior. For example, send certain content to people who’ve never purchased or haven’t purchases in a while. As you grow your list and learn more about them, find new ways to segment. For each segmented group, create highly relevant content for that group. Use automated editing tools to change keywords and re-purpose content for each group to avoid having to create all completely new content. Segmentation and automation go hand in hand. Automation helps you get the email in front of the right person at the right time. This may be a certain time of day or week. It could be after the person completed some action. Certain emails will be more relevant at certain points in the buying cycle. For example, welcome emails are the most viewed single piece of content a business ever creates. Use them wisely. Send them out automatically. Want to increase website traffic fast? Hire an influencer. An influencer is a person who already has a following and influence among your target audience. Generally, they’ll share something with their social media followers. Don’t think “superstar” like an NBA player. Think more practically to get influencer marketing without the million dollar price tag. Reach out. Ask them to share your website with their fans. They may ask for some compensation. Don’t pay anything crazy. But do recognize their value. They’ve spent time building a following even if it only takes 2 seconds to share something. Here’s a fun fact. Today, influencers don’t even have to be people. There are pets who have a huge social media following. They’re paid to share brands just like a real person might be like these instafamous doodles promoting Waffle House on National Waffle Day. SEO is the best way to increase website traffic. It increases your visibility in search engines. It’s best because it delivers long-term, sustainable results with ongoing SEO maintenance. But it’s not exactly fast in comparison to the other options we have given you to increase website traffic fast. Here are some things you need to know if you’re considering SEO. SEO stands for search engine optimization. You can’t optimize a website (at least not easily) after the fact. SEO starts with how a website is built from scratch. If you’re serious about SEO, you’ll invest in an SEO website. When you build an SEO website from scratch, your existing customers and new visitors will instantly notice. Everything runs more smoothly. It’s easy to find what they’re looking for. There are never distractions or confusion. It feels like the website was built specifically for them. You’ll notice the difference too. People who visit your site will stay longer and click on more pages. You’ll have much higher conversion rates and fewer people abandon the site. It’s impossible to optimize anything without research. Guessing what terms people use to find sites like yours will not help your website. Learn what your competitors are doing. Use online tools to learn more about how people find sites like yours. Then start building strategies around what you learn. These useful techniques will help you increase website traffic fast. Remember to set a budget and use analytics to keep any campaign on track. Are you struggling to get more traffic fast? We can help you apply proven traffic-generation techniques. Contact us for a free consultation. Do you have more ideas on how to increase website traffic fast? Share them with us in the comments below. Great article! I am trying to increase visits to my website which sells billing software. Very helpful. Thanks for sharing it.